The 2016 Medical Cannabis Concentrates Cup wrapped up on Sunday with some new faces – as well as some familiar ones – taking home trophies. See the photos! Thanks to all who made this such a historic event, particularly our premier sponsors: Advanced Nutrients, Moon Rocks Atomik420.com, BAMF Extractions, CannaSutra Collective, LA Kush Genetics, Downtown Patient Collective, Higher Vision Cannabis, GreenWolf Cali, Nameless Genetics, New Amsterdam Naturals, SourceVapes, and The Cali Connection. HIGH TIMES edibles editor Else McDonough led a cooking demo in the VIP area. 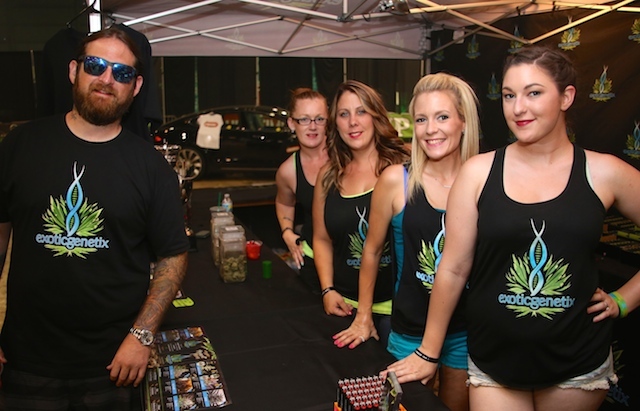 AT BAMF, the dab hostesses kept the rigs hot and loaded. The VIP entertainment stage featured Frank Castillo, who made the ganja crowd giggle. Mike and his Exotic Genetix team won the Cannabis Cup for Nest Non-Solvent/Water Hash & Kief. On Sunday night the Cannabis Cup Awards show got underway. Exotic Genetix also won the top prize for Best Glass for the Scozz Dragon. The OGX Digital Rosin Press grabbed top honors for Best Product. A.H.H.S. West Hollywood and Cali Sift Co. took the Cup for Best Solvent, Compound Concentrate.